1. Employees begin accruing sick leave on January 1, 2018. Nearly every employee will begin accruing sick leave on January 1, 2018. This includes agricultural workers, seasonal workers, and workers here under an H2-A contract. Those employees who are exempt from the Minimum Wage Act are exempt from paid sick leave, including certain salaried workers and inexperienced hand harvesters. However, the majority of workers will accrue paid sick leave. Sick leave accrues at a rate of 1 hour for every 40 hour worked. This is 0.025/hour, 90 seconds/hour, or 50 hours a year based upon a 2,000-hour year. However, it is not prorated, meaning an employee must work a full 40 hours in order to earn an hour of sick leave. There is no cap on the number of paid sick leave hours an employee can accrue during a year. Accordingly, the more an employee works, the more paid sick leave the employee will accrue. 2. Employees will be eligible to use leave after 90 days of employment. An employee is eligible to use any accrued paid sick leave after 90 calendar days of employment. This means that if an employee is hired on January 1, 2018, the employee could not use any of his or her accrued leave until April 1, 2018. However, if on January 1, 2018, a person has already been your employee for at least 90 days, the employee is eligible to begin using paid sick leave as soon as it is accrued. 3. Employees can use the accrued leave for authorized purposes. The employee may take paid sick leave to care for himself or herself or to care for a family member, including regular appointments and check-ups with doctors, dentists, opticians and other providers. The employee can use sick leave when the employee’s workplace or child’s school or place of care is closed by a public official for a health-related reason, but not for snow days. In addition, the employee may use the leave for a qualifying absence under Washington’s Domestic Violence Leave Act. Although sick leave is accrued on an hourly basis, it can be used in any increment that the employer uses to track employee working time. For example, if you round to 15-minute increments, employees can take sick leave in 15-minute increments. If you track time down to the minute, then an employee could use 12 minutes of sick leave. The largest amount of time that you can require someone to take leave is in one-hour increments, so even if you pay a day rate, employees can take their sick time in hourly increments. 4. Employees do not have to provide many details. One of the more frustrating parts of the new law for employers is that there is almost no employee accountability for how employees are using their paid sick time. You may never know if your employee is really sick or is staying home for personal, non-health-related reasons. Employers are not permitted to ask an employee whether he or she is sick or the nature of his or her condition. Also, employers may only ask for verification (such as a doctor’s note) when an employee misses more than three consecutive days of work. Even then, the doctor’s note doesn’t need to indicate the nature of the condition. In addition, if providing a doctor’s note is “burdensome,” the employer must either alleviate the burden or allow the employee to provide verification in some other way such as the employee's own written statement. 5. Sick Leave is paid based upon the employee’s normal rate of pay. An employee is paid sick leave at the rate the employee would have earned on the day the employee misses work, even if that rate is greater than the rate at which the sick leave was accrued. For an employee paid partially or wholly on a piece rate basis, divide the total earnings by the total hours worked in the most recent workweek in which the employee performed identical or substantially similar work. Because an employee may perform different types of piece work in a particular week, or a combination of piece work and hourly work, there may be some challenges in determining the appropriate rate of pay. 6. Employers have notice and record-keeping requirements. 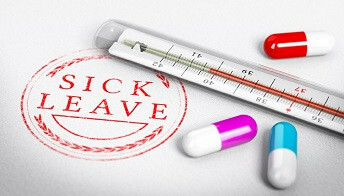 Employers have to notify employees that they are entitled to sick leave, the rate that the employee will accrue paid sick leave and the purposes for which the leave can be used. The notice must include a statement that retaliation by the employer is prohibited and should provide the name and phone number of a person to receive reports of retaliatory conduct. Employers must provide each employee a monthly accounting of the amount of sick leave accrued, the amount of sick leave used and any unused sick leave available for use. This notice can be written or electronic and may be included on a pay stub. 7. Employees have reinstatement rights. If an employee is rehired by an employer within 12 months after the final date he or she previously worked for the company, the employer must reinstate the employee's accrued, unused paid sick leave. If the employee has not yet reached the 90th day of employment, the employee's prior employment counts toward the 90-day requirement. 8. Accrued sick leave is carried over into the next year. At the end of the year, up to 40 hours of unused accrued paid sick leave will roll over to the next year. Employers can carry over more if they like. Hours in excess of the carryover amount will be lost if not used. It is anticipated that many employees may use their sick leave in the weeks leading up to the end of the year rather than lose them leading to additional absences in November and December. An employer is not required to cash out unused hours, but may wish to do so if staffing toward the end of the year becomes a problem. Sometimes the use of paid sick leave will come at an inconvenient time. Employers will suspect, but not be able to prove, that an employee who is “sick” every Friday in December is really using that time for something else. Employers and supervisors are going to be frustrated. However, employers cannot retaliate against an employee for use of paid sick leave. You cannot count these absences against them for disciplinary purposes or in making promotion and other employment decisions. Education and training for everyone in a supervisory role will be necessary. Fines for retaliation start at $1,000 per violation and the Department of Labor and Industry has already allotted staff for retaliation complaints. Salaried worker employed in a bona fide executive, administrative, or professional capacity or in the capacity of outside salesperson are exempt. RCW 49.46.010. (iii) who has been employed in agriculture less than 13 weeks during the preceding calendar year. For further assistance in establishing policies and/or implementing your company’s various notice and recordkeeping obligations under I-4333, please contact Sarah Wixson at 509.853.3000 or sarah.wixson@stokeslaw.com.